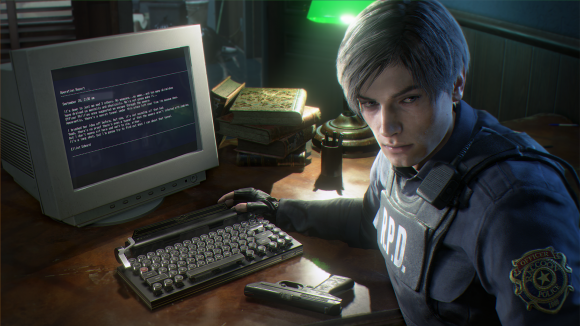 Capcom and Qwerkytoys have teamed up to create a Resident Evil 2: Remastered Edition themed mechanical keyboard. The fully-equipped Bluetooth Qwerkywriter S board, complete with Umbrella Corporation Logo and Lexington branding, is available for pre-order on the E Capcom store in Japan and will be shipping from January 25, 2019 alongside Resident Evil RE: 2. Despite the almost-definite Japan-only release, the board itself actually features an English ANSI layout. The Qwerkytoys board bears close resemblance to the series’ precious save points scattered around most of the games in the series, specifically the board donated to the Racoon City police in Resi 2 by the Umbrella Corp.
Luckily for any prospective buyers, however, you won’t be needing ink ribbons everytime you want actually use the thing – it’s a little more high-tech than all that – but the premium edition will come with 4 rolls in the box. The board is quite a bit sleeker than the various typewriters found throughout the series, and its all aluminium chassis comes in at a much lower-profile too – likely so you can actually see your PC screen beyond it. 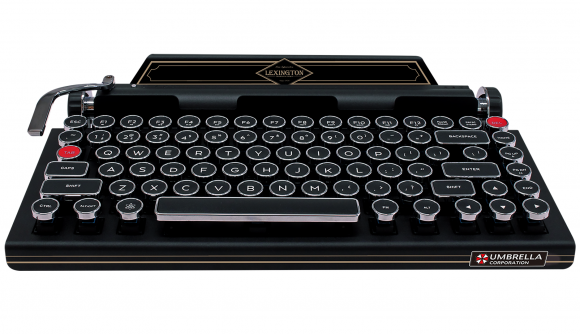 As for the insides, the Resi-themed Qwerkywriter S comes with Bluetooth connectivity, n-key rollover, wired USB support, and, last but certainly not least, Cherry MX Blue mechanical key switches – topped with retro-style chromed keycaps. There’s also a few retro callbacks with new found purpose, too. The return bar is actually a completely programmable macro key, and the paper roller knobs on either side are actually volume and mouse scroll controls. The paper bar has also been tailored to fit various popular tablets up to a 10.5-inch screen size. 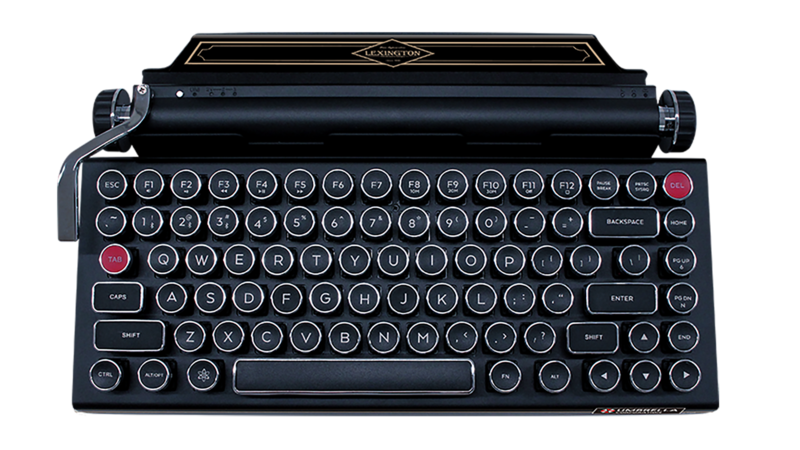 This Resi typewriter throwback will cost you 75,000 Yen ($676 USD) for the base set, with a premium version (complete with ink ribbons and Resident Evil RE: 2 among other collectables) coming in at 99,800 Yen ($900 USD). Both are available exclusively through the E Capcom store (via Gamersky). Despite the extras included with some of the top-end packages, the unit is essentially a rebadge of an almost identical keyboard that costs just $249 on the QwerkyWriter website. If you’re feeling a little frugal, and I don’t blame you if for not wanting to spend Nvidia GTX 1080 Ti money on a typewriter in 2018, you could probably give the standard board a Resi makeover without too much hassle. But you didn’t hear that from us. The Biohazard version is unlikely to launch in the US or UK anyways, so you might have very little choice in the matter.